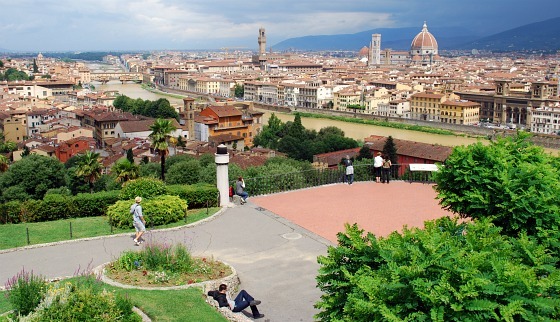 Piazzale Michelangelo offers picture postcard views of Florence. The public square sits on the hillside and has an uninterrupted of the city including its finest bits of architecture. You can see the terracotta dome of the Duomo, the fortified tower of Palazzo Vecchio and the marble campanile bell tower. The easiest way to get to Piazzale Michelangelo is to catch the Hop-on, Hop-off Bus Tour which stops right in the square. If you want to walk, the route includes either a series of flights of stairs which you take from the main road along the river, next to Porta San Niccolo or one long stairway which you can take from Porta San Miniato. 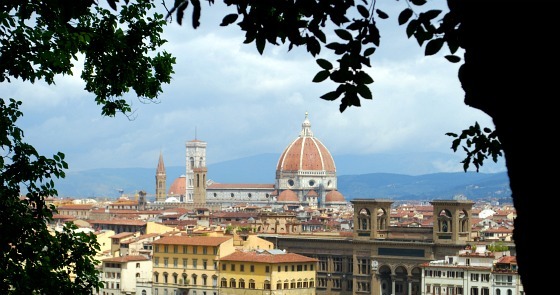 To make the most of our trip to Piazzale Michelangelo, we took one route to get there, and the other to get back. Following the signs from the bridge after the Pont Vecchio, the route was under an ancient arch and then up a huge flight of stairs on Via di San Salvatore al Monte. At certain points along the stairs there are entrances to a small park which is really pretty and contains fruit trees and flowers on tiered levels. There and also small viewing areas. We continued to the top of the stairs, by which time our legs were really throbbing! The terraced viewing area at the top is huge, so there should be plenty of opportunity to take photos even on a busy day. There are also greener garden areas slightly below the main road level. Behind the road is a cafe and restaurant and behind that is a lovely little church (pictured below). You can also see the view from the church steps. We returned down the road way which is crossed by footpaths and stairways ending up at the foot of the hill by a tower called Torre San Niccolo. 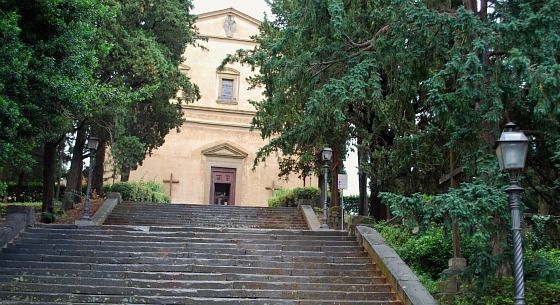 With hindsight, we think we’d have been better doing our journey the other way around as the flights of stairs and walkways leading up from the tower don’t seem as steep and arduous as the long flight of stairs on Via di San Salvatore al Monte. Access to Piazzale Michelangelo is via either Porta San Niccolo or Porta San Miniato. Both routes lead from the main road along the river. You can also catch the Hop-on, Hop-off Bus Tour to get there.